Tetrodotoxin is the neurotoxin found in fugu, or pufferfish. Fugu is a Japanese delicacy most commonly served sashimi style. If you’ve had bad fugu, you know within five minutes. A tingling sensation typically starts in and around the mouth and tongue. And well, it all goes downhill from there. Some adventurous diners and fugu aficionados purposefully ingest small amounts of the poison for the tingling sensation and the feeling of “lightness” that may result. In fact, there are fugu ryoteis (fugu restaurants) in Japan that display banners signifying the amount of tetrodotoxin served in their fish, sort of like the chili symbols at your favorite Thai hole-in-the-wall letting you know how piquant a particular plate is. Except at a fugu ryotei, there’s much more at stake than a burning mouth. My own experience with fugu was at the now-shuttered Hump sushi restaurant in Santa Monica—the place notorious for being stung by the feds and eventually shut down for serving illegal whale meat. What qualifies as a special occasion? Who knows? But my first time facing off with fugu was certainly not unspecial, by any means. The exact type of pufferfish I ingested is called torafugu, or tiger pufferfish, because of its tigerlike markings. The tetrodotoxin level of a torafugu when compared with a common fugu is dramatic: A single common blowfish contains enough poison to kill up to 30 adults, while the torafugu’s ovary alone has enough deadly neurotoxin to kill 20. With that factoid in mind, I watched the chef unwrap his prized fugu hiki, a long, sharp, polished knife whose sole purpose is the preparing of fugu. This, I thought, was a good time for the chef not to cross-contaminate anything—especially your California roll. The slices were tissue thin, almost transparent with grayish-white flesh. Each feathery piece was placed on an ornate platter so that the design underneath was still visible as if through a fog. For starters, I was served a fugu sake drink made with hot sake and fugu fins. It had an alien appearance: murky white liquid with a fin or two jutting up like icebergs. I brought the large cup to my lips and slowly sipped. The drink tasted like a soup—salty and savory, with a heady sweetness from the sake. And then I felt a tingle, a “lightness.” The feeling was exhilarating but also unsettling. Was this the poison I was experiencing? Would my nervous system begin powering down one vital function after another? Was I, in fact, eating my last meal? It wasn’t the tetrodotoxin. Most likely I was feeling the boozy effects of the sake. I was buzzed. At last it came time to feed on fugu. The presentation was exceptionally beautiful. There were edible flowers, sprouts, daikon, and sudachi citrus. 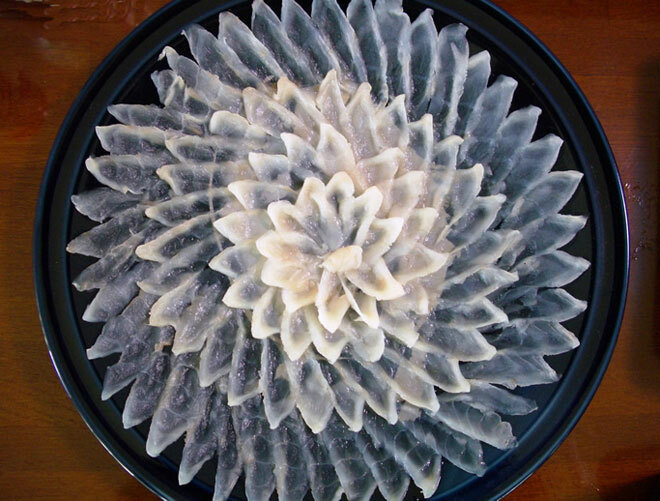 The fugu slices were arranged to look like a chrysanthemum. In Japan, the chrysanthemum symbolizes death. Not a comforting thought. I gently peeled a slice from the platter, dipped it into the sauce, shut my eyes, ate, and waited. And waited. There was nothing. No tingling. No lightness. No dizziness. No tightness in the chest. No flavor. Although my flirting with death by fugu was anticlimactic, I’m happy to have tried it. And instead of kicking the bucket from eating pufferfish, now I can cross it off my bucket list. That’s a pretty good trade-off, if you ask me.